Travelling light has never been one of my virtues. It always figures on my new years resolutions which hopefully i'll be able to adhere to, someday! However, road trips are never an issue. The boot space of our vehicle almost always accommodates my luggage. The problem arises when I’m taking a flight. And I have a record for not having boarded a single flight, both domestic and international without paying excess baggage. Take this recent journey for example. Since this was going to be a long stay at my parents, and I had extensive cooking and baking plans, I travelled with my electronic weighing scale, measuring cups and a few other nick nacks. My cameras and lenses go with me where ever I go too. Add to this my clothes and accessories! And I now have a baby so his clothes and essentials are packed too. All bare necessities in my opinion! No wonder that Ro starts asking me to pack 3 days before our intended departure date, which almost always never happens, leading to last minute packing chaos! After having landed at my parents, I got busy with organizing my workflow and finishing much of the undone work and my cooking and baking plans got extended too. I soon realized that I was losing out on many things while absorbed with my workflow management. 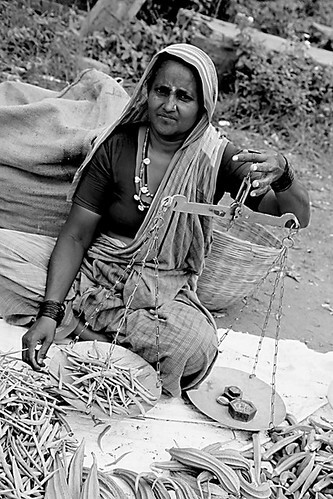 One of this is what is called the “Santhe” (in Kannada, a regional Indian language) which is somewhat akin to the western farmers market. Villagers and farmers congregate at a certain designated place to sell seasonal produce (not necessarily organic). 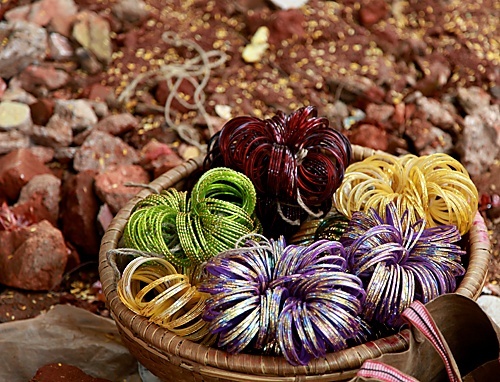 Also on display for sale are colourful bangles that compete for attention amidst a vibrant display of locally grown fruits and vegetables. 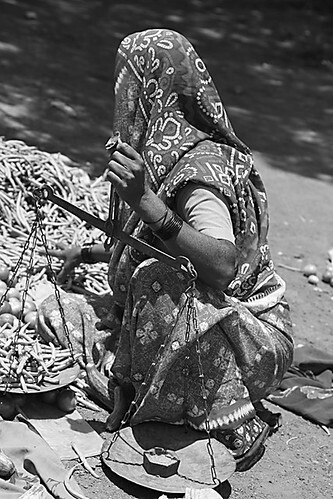 I was most interested in taking pictures of the indigenous weighing scale, the “thakdi” before it becomes extinct, apart from the produce and the people selling them. 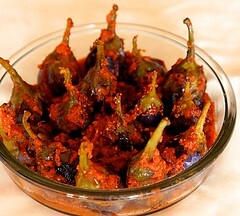 I also bought some eggplants, known as brinjals in India to make this vegetable side. 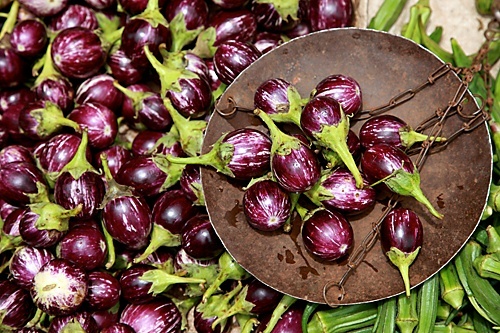 There is much controversy regarding the introduction of genetically modified BT Brinjalsin India. I was lucky to find this native variety. Eggplants in tangy tomato gravy was one of the first dishes I learned to make and it was discomforting to me that I had not yet written about it here. It is a simple dish that is lightly spiced and full of flavour. It would taste great with this rice or simple rotis. Add a dal and a salad and you have a simple and satisfying menu. 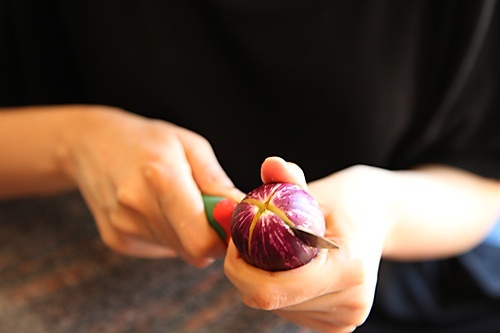 Using a sharp knife, make four slits into the base of the eggplant, keeping the stems intact (you could also remove the stems). This will make sure that the gravy gets evenly coated inside the eggplants. Place the eggplants in lightly salted water. This will prevent them from turning black. With the help of a knife remove the eyes of the tomatoes, cut them into quarters and blend them to a puree using a food processor or a blender. In a wok or a kadhai, heat the oil over a medium flame. Add in the ginger and stir for a few seconds. Put in the tomato puree and bring to a boil. This should take about 3 to 4 minutes. Stir in the corinader powder, red chilli powder and salt. Mix well. 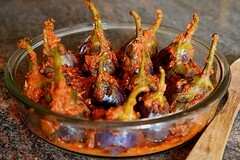 Put in the eggplants, cover the wok and allow them to cook in the tomato puree, stirring ever 5 minutes. Cook until the eggplants are done, about 15 minutes or until a a fork or skewer can easily pierce through the eggplants. Depending on the water content of your tomatoes, you might have to add in a few tablespoons of water when the eggplants are cooking to prevent the entire mixture from sticking to the bottom of the wok. Serve hot or warm with rice or rotis. *In India, the eggplants are usually not bitter, so immersing them in lightly salted water for 10 minutes, does the trick. 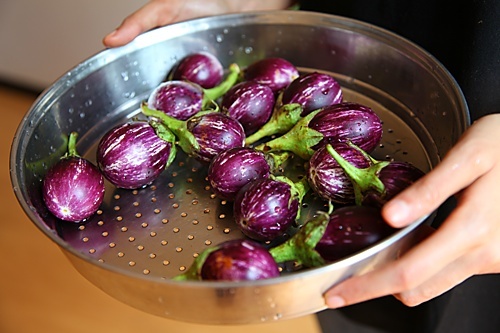 If you feel that your eggplants maybe bitter then its a good idea to marinate them in salt over a colander and allow the bitter juices to drain. Wonderful snaps.. thanks for the delicious recipe.. looks too good !! Wonderful clicks as usual….Hope you had a blast at your parents home!!! Love the opening shot….and i almost always love the sharpeness in all your clicks…Awesome!!! 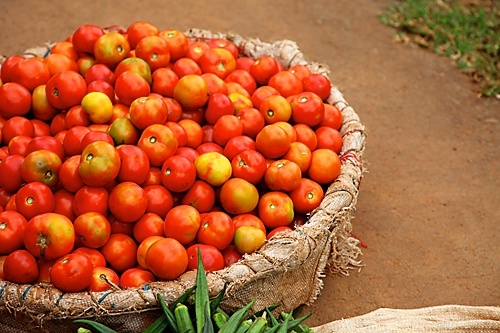 I love tomatoes…its like i have a perennial love for them…Shd try this one soon!!! Looks so yum! I never liked eggplant as a kid, but now I enjoy it every now and then. 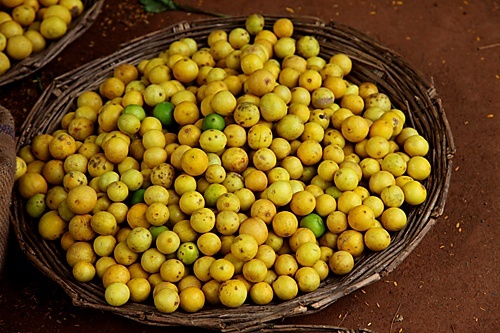 Shaheen: I didnt eat them as a child too, but now I love them and eat them in various ways. As a vegetarian, I appreciate and love this dish. I also love your photos. Amazing! Pankaja: Come over. :-) Its been a long time! A really long time! 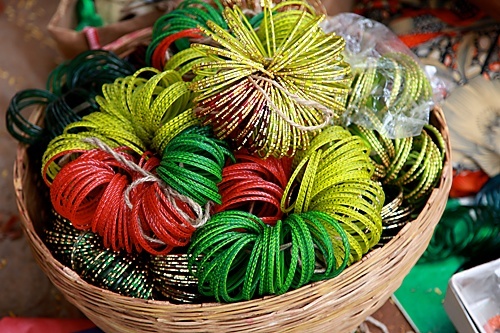 howcome nothing special on the eve of Janmastami? nice pics. 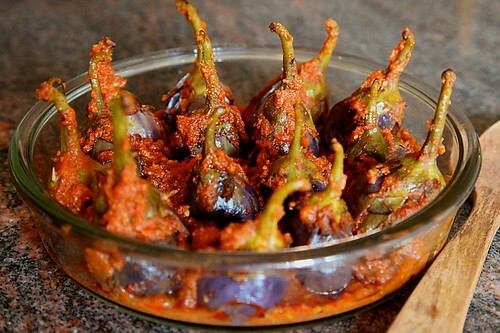 and easy recipe .i make eggplants same way except i also use onion paste and some sauf powder in its curry.i never tried this easy way but now i am going to try your recipe. Hi Anu I made your brinjal curry. It was so good the bowl was licked clean. The ingredients were so simple that I wondered first but gave it a go. Wow! Thanks. Been trying out more dishes from your blog. All good stuff. Poornima: Glad you liked this delicious curry!